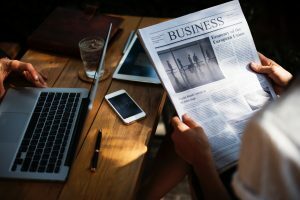 You know how important it is to keep up with what’s going on in the 401k industry so you can stay ahead of your clients and your competition; but which newsletters should you be reading so you don’t waste time sorting through emails that provide no value? FredReish.com: Fred doesn’t post to his blog very often (compared to most bloggers), but when he talks, you should listen. Fred is the leading ERISA attorney in the 401k industry. 401khelpcenter.com: This is truly the most comprehensive website I’ve ever seen for the 401k Advisor. Rick Meigs, President of 401khelpcenter.com, is a content curator KING. You can subscribe to his weekly digest where he aggregates the latest published material on 401k trends, fiduciary issues, legislative action, court cases, opinion, rule changes, insights, white papers, surveys, studies, commentary and more and sends out the headlines with links in a weekly e-zine. InvestmentNews.com: There are actually two newsletters on this site I’d recommend you sign up for, but don’t worry – one is monthly and the other is quarterly content. The Adviser’s Consultant (monthly) provides targeted intelligence that helps advisers manage their practices more effectively and grow their businesses and the Retirement Plan Adviser (quarterly) identifies what financial advisers need to know about working with defined contribution and defined benefit plans – and how advisers can gain a larger portion of this growing market. Want an EASIER way to keep up with industry news? 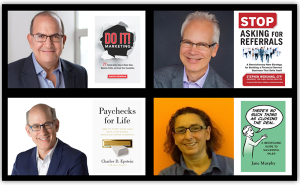 Since I already subscribe to each newsletter listed in this article, included in our blog newsletter is a “Resource Roundup” of top articles and links that can help you grow, manage, and scale your 401k business. I read and share what’s most important, you save time and keep up with industry news. Even in a fairly small sector of the financial industry (like the 401k space), you may be surprised at how much great content and value you can find. Since perspective defines value, let me share with you nine more newsletters I read and find valuable, and I’d encourage you to take a look and decide for yourself if you should subscribe. Remember the goal is to keep current with industry trends, regulations and best practices, not get bogged down in them so I’d suggest you selectively evaluate the content on each site and subscribe only to those newsletters you find the most relevant for your practice. Napa-net.org offers a daily newsletter with topics that include Managing a Practice, Plan Optimization, Sales & Marketing, and Technical Competence. NewsDash by PLANSPONSOR.com is a daily email that highlights key legislative and other issues important to plan sponsors and professionals. PlanAdviserDash (also by PLANSPONSOR.com) is a daily email that has provides updates that are important to advisors and other service professionals working in the retirement industry. The IRS offers a monthly newsletter titled Employee Plans News geared toward retirement plan practitioners – attorneys, accountants, actuaries, and others with information about retirement plans. If you visit their website, you can view their current edition, browse the newsletter archive, or subscribe to future editions. fi360 Blog is a blog that features insights from the fi360 team on the issues affecting investment fiduciary responsibility, including current developments in legislation, regulation and litigation, implementing prudent investment practices, answering your fiduciary questions, and more. They are also the fiduciary blog of InvestmentNews.com. 401k Best Practices Blog (You had to know this was coming, right?) is the newest 401k practice management blog for advisors that want to build a successful (and compliant) 401k practice – just click the “Yes, send me updates” button below and sign up! Yes – send me updates! FiduciaryNews.com – Chris Carosa also has a fantastic blog at FiduciaryNews.com where he provides essential information, blunt commentary and practical examples for the ERISA/401k fiduciary, the individual trustee and the professional fiduciary. With well over 6,000 subscribers (and growing) and more than half a million visits over the past 5 years you should definitely check it out. TheRosenbaumLawFirm – Ary Rosenbaum also has a great blog where he writes with a bit of humor and a tell-it-like-it is style about what advisors and plan sponsors should know and do in order to run a compliant employer-sponsored plan. TheMorningPulse is a great resource that Jeffrey Snyder put together. He summarizes the news for the day in a multitude of disciplines, including defined contribution and investments. Many of my links for the weekly roundup are thanks to Jeff’s in-depth and comprehensive research. FinancialPlanning.com is a great newsletter for general business and practice management topics. FSI Newsbrief is a newsletter that breaks out topics by top news, policy watch, and business building and includes a daily snapshot of the financial industry with news from The Wall Street Journal, Reuters, and other leading sources. ThinkAdvisor.com has several options to choose from for how frequently you’d like to get their newsletters and each one is loaded with the vital news, analysis, market info, practice management, retirement, compliance, and portfolio tips you need to increase your business and grow your bottom line. 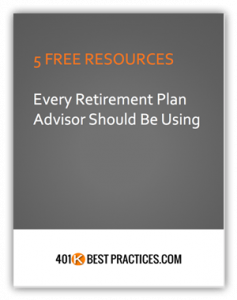 Question: If you have found a great resource for 401k advisors that you think should be added to the list – let me know!